A fungus that kills amphibians is responsible for the biggest documented loss of nature from a single disease, say researchers. Better biosecurity and wildlife trade restrictions are urgently needed to prevent any more extinctions, they say. The disease, chytridiomycosis, has caused mass die-offs in frogs, toads and salamanders over the past 50 years, including extinctions of 90 species, according to a review of evidence. It has spread to over 60 countries. Australia, Central America and South America are particularly hard hit. 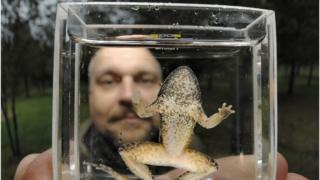 "Highly virulent wildlife disease, including chytridiomycosis, is contributing to the Earth's sixth mass extinction," said Dr Ben Scheele of The Australian National University in Canberra. "We've lost some really amazing species." 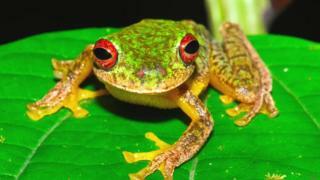 Three decades ago, scientists began to notice amphibians were dying around the world. The suspect was identified as a fungus called Batrachochytrium dendrobatidis (Bd), which attacks the skin of amphibians, effectively "eating them" alive. "Humans are moving plants and animals around the world at an increasingly rapid rate, introducing pathogens into new areas," said Dr Scheele. 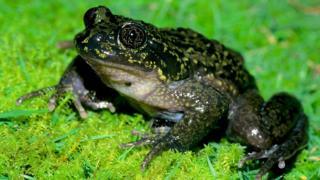 According to two Canadian experts, the fungus is "one more nail in the coffin for the state of amphibians globally". Habitat loss, exploitation and climate change are still the main threat for thousands of species, say Dan Greenberg and Wendy Palen of Simon Fraser University in Burnaby, Canada. "These stressors often act in concert, but clear management actions exist to address at least some of them: protect habitat, limit collection of wild populations, and restrict trade," they wrote in an article commenting on the new research in Science.